Decorative Life: Lasts from 3-4 plus weeks depending on environment and care. Growth retardants are recommended however care must be taken to use the right one at proper rates as leaf damage can result. One growth retardant that reportedly should not be used is Daminozide. Native to South and Tropical Africa and Arabia. More common relatives include aster, sunflower, daisy, chrysanthemum, lettuce and zinnia. Species is classed as a dicotyledon, leaves not parallel veined. Flower heads solitary at stem ends, with outer row of ray flowers and inner center of disk flowers. Stems are leafy, leaves 2-4 inches long. From the Greek “osteon” (a bone) and “sperma” (a seed), referring to the shape of the seeds. ‘Calypso’ has a creeping habit with large lilac flowers. 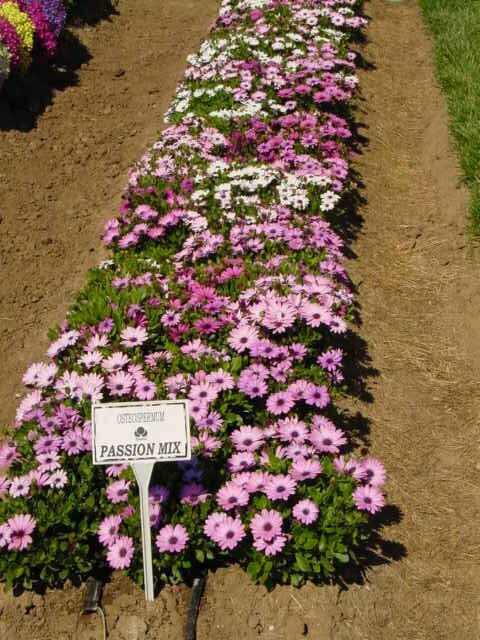 Some favorite cultivars and their respective flower colors include ‘Seaside’ (salmon), ‘Wildside’ (fuchsia), ‘Zimba’ (white and yellow), ‘Sunscape daisy’ (white and purple bicolor), ‘Sunny Side’ (mostly yellow), ‘Silvia’ (pastels/white) and ‘Brightside’ (white/blue).